On Tuesday, July 17, 2018, President Rodrigo Duterte's Consultative Committee (Con-com) declared that Pres. Duterte himself is banned from running again as President as stated in the “final official copy” of the proposed federal Charter. 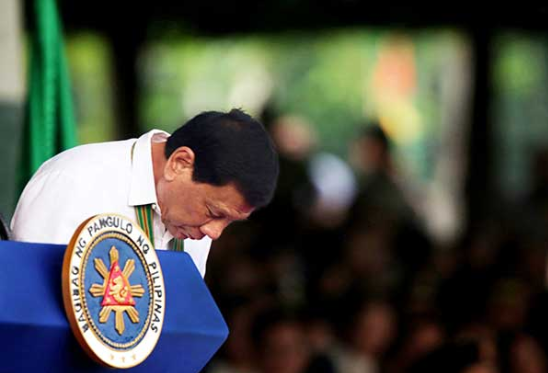 As established on Section 2 of the revised Article XXII or “Transitory Provisions” under the proposed federal Constitution, the obligatory President is disallowed from running as President in the 2022 elections under the Constitution. "The incumbent President is prohibited from running as President in the 2022 elections under the Constitution,”, the draft Charter states. 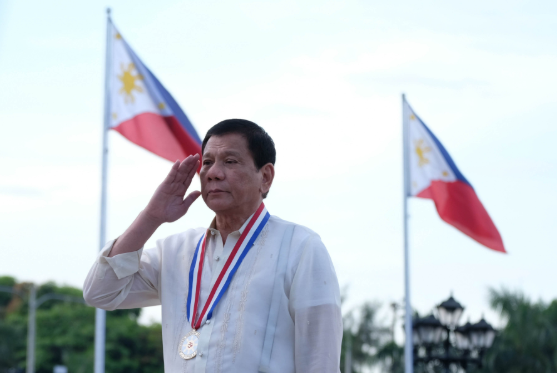 Likewise, Section 1 of Article XXII, also declared that the term of the President and the Vice President, which will end on June 30, 2022, will not be expanded anymore. “The term of the President and the Vice President, which shall end on June 30, 2022, shall not be extended,” it read. 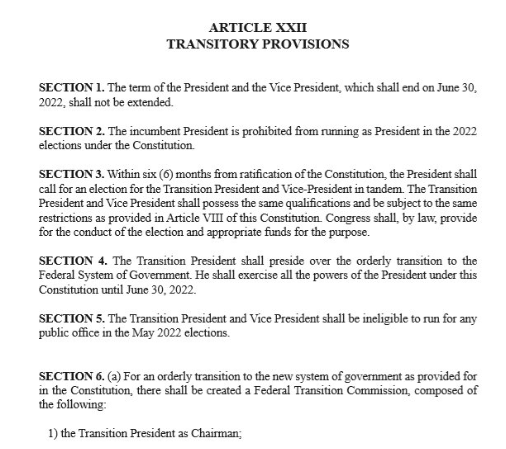 Moreover, Section 3 of the article expresses that the binding President "shall call for an election for the Transition President and Vice President in tandem", inside a half year from sanction of the federal Constitution and shall practice every ability of the President under this Constitution until June 30, 2022. “The Transition President and Vice President shall preside over the orderly transition to the Federal System of Government. He shall exercise all the powers of the President under this Constitution until June 30, 2022,” it states. It also states that the Transition President and Vice President will be disqualified in running for any public office in May 2022 elections. “The Transition President and Vice President shall be ineligible to run for any public office in the May 2022 elections,” the draft Charter added. Correspondingly, Ding Generoso, Con-com representative, clarified that Vice President Leni Robredo may in any case run for President on the off chance that she desires to. “The VP may run if she wishes to but not the incumbent President (Duterte),” Generoso said. The Con-com representative then added that when a transition President and VP are previously chosen, by operation of Sections 3 and 4, the incumbent president shall convey the control of government to the newly elected president. “Once a transition president and vice president are elected, by operation of Sections 3 and 4 (of the Transitory Provisions), the incumbent president shall turn over the reins of government to the newly elected transition president,” Generoso added.